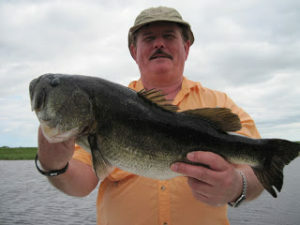 I really enjoy going fishing with Onecastaway’s Capt. Dean Herdman . He really knows where the fish are and what to use to get them to hit. Going out with Dean is not like a typical customer / Capt. relationship, it’s more like fishing with an old friend you haven’t seen for a while. 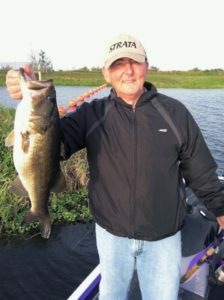 Deans’ knowledge of the lakes we’ve fished, his skill to consistently put you onto Big Bass, coupled with his sense of humor and professionalism always make for an excellent experience. 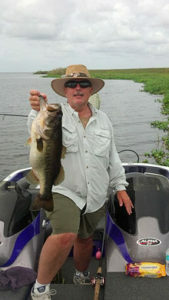 I highly recommend taking a guided fishing trip with Bass Professional Guide Service. Thanks for the terrific time I had fishing with you at Stick Marsh 13 last week. My trip with you in Feb 2012 was awesome, but this year was even better. 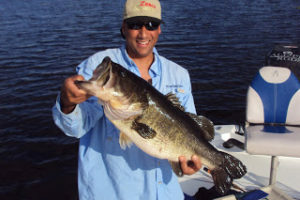 As you are aware, I caught over 20 large mouth bass and 8 of them over 6 lbs. The smallest was 3 lbs and they averaged 5 lbs. I can’t wait for next year. I still can’t believe that you were able to catch (retrieve) the pliers you accidentally dropped in the water with a bar magnet or(it seemed with ease) to retrieve a hooked pelican and remove the hook from its bill. Thanks again for all the great memories. p.s. I really like your new boat..
Tori and I finally got back to Maryland today. I wanted to tell you how much we enjoyed the day of fishing we spent with you. It really was the highlight of our trip. Tori has talked about it every day. 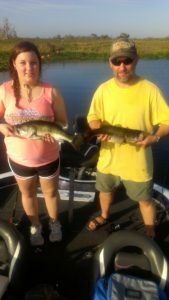 We fished several other places during our time in Florida but nothing compared to the fabulous time we had with you. Thank you so much.